Happy first day of September! We’re finally back home again after our month away, and I’m starting to get excited about fall. Are you? I think dressing for fall is more fun than any other season. It’s all about layers and texture in a way that just isn’t possible in summer heat. Come to think of it, spring is pretty good in that regard, too, for those of you Down Under. Since fall (or spring) weather can be fickle, I think it’s nice to have light outerwear that can be layered to accommodate a variety of temperatures. 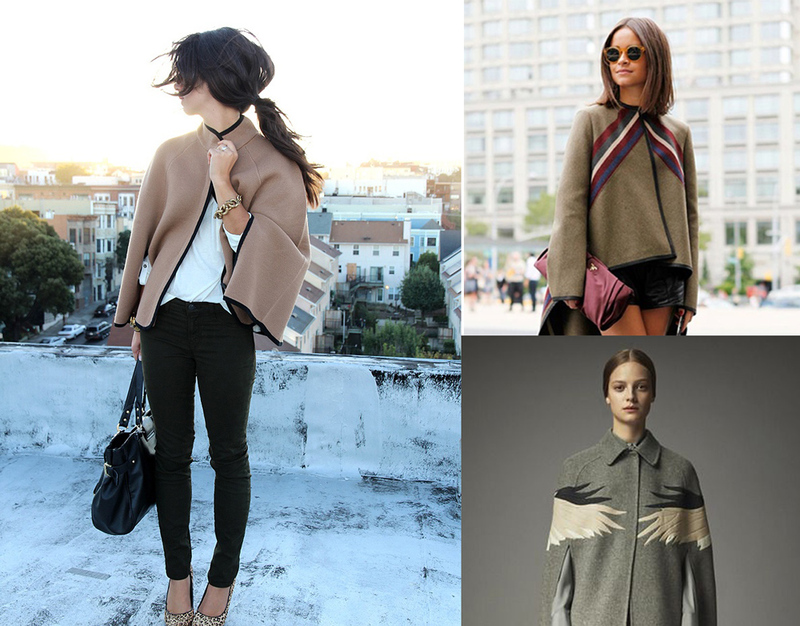 Our cape patterns are just the ticket here. For women, that would be the Woodland Stroll Cape pattern. For kids the equivalent would be the Forest Path Cape. One of the things I like about this particular style is that it doesn’t look or feel too costume-y, the way that might come to mind when you hear the word “Cape.” It just looks and feels like a lightweight jacket, but it’s much easier and faster to make and doesn’t require much fabric. Plus, it’s a great way to add details to personalize it to your preferences. 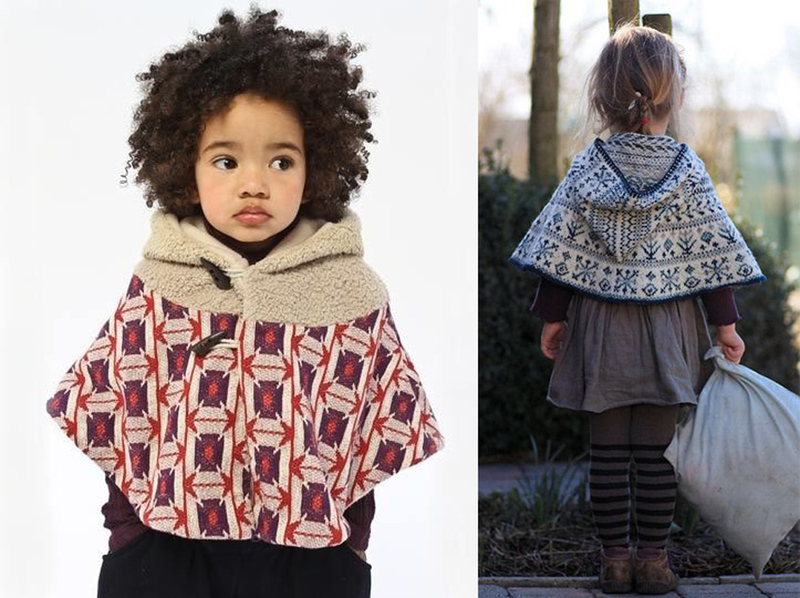 Here are a few inspirational ideas for making your own cape. 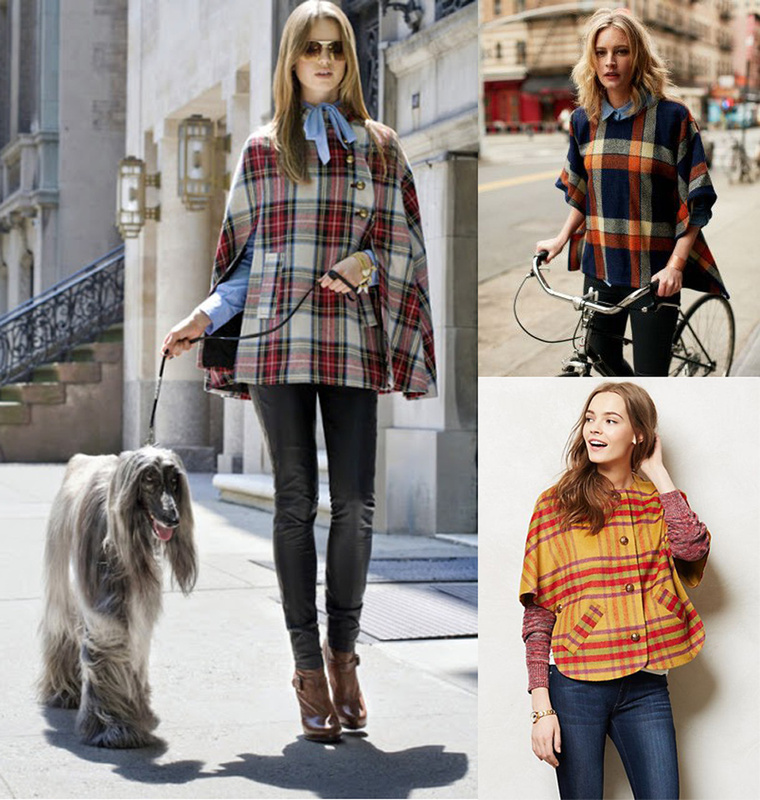 Obviously, fall is all about plaid, right? So plaid wool is an obvious fabric choice, and it works beautifully with these patterns. I especially love vintage-looking plaids–particularly the fabrics with slightly unusual color palettes and interesting patterns. I’ve seen quite a few of them in Beckenstein’s and at Mood lately. And what about patterned fabrics? I think the capes in both of these photos are knits, which you could also use. But I’ve been seeing some wonderful patterned woven fabrics in the stores as well, with some really interesting patterns and color palettes. You could always take more of a rainwear approach to the cape, too. 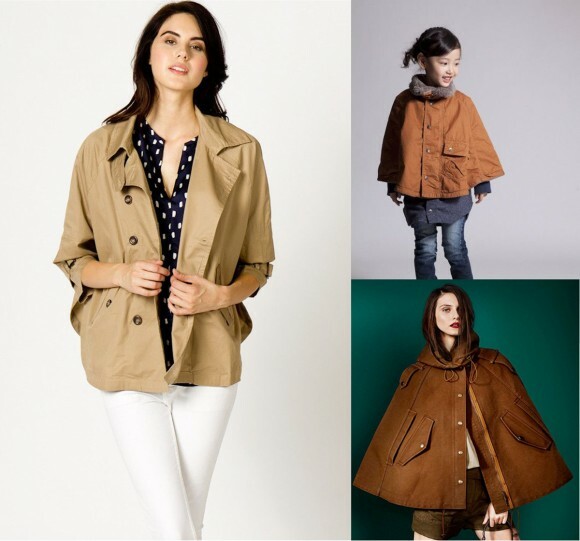 I love how the cape on the left plays with classic trench coat details (you could refer to our Secret Agent Trench Coat pattern and borrow some of those details if you want), but you could also make the cape from a melton wool or from a coated twill or waxed cotton for a more rugged look. Add lots of topstitching, some heavy-duty snaps, and maybe a cargo pocket (refer to our Field Trip Cargo Pants pattern for help there) or a welt pocket (refer to our Art Museum Vest and Trousers pattern) and you’ll have a really impressive-looking piece of outerwear! I love other applied details, too. You could do something as simple as adding contrast binding to the outer edge of the cape for a great detail, like the cape on the left here. The chevron stripes are a great idea, too. You could use ribbons or make your own single-fold binding from contrast colored wools for this detail. And the appliqued wings are gorgeous! When I first saw this photo I imagined two arms wrapping around the shoulders of the cape to give the wearer a big hug. Wouldn’t that be a sweet detail for a child’s cape? You could also play with textures, like the faux fur or velvet used for these capes. And I’m a big fan of luxurious, simple, elegant camel-colored cashmere or wool, which would look so sophisticated and understated all season long like the cape on the right. I think it’s also fun to see how the capes were styled for the photos, and what’s being worn with them. It might give you ideas for styling and wearing your own cape. If you’d like to see more, I’ve been collecting photos in a Capes Pinterest folder. I love these, especially the kid ones. Unfortunately, my daughter will not go for any of them. Really beautiful stuff, thanks for sharing this with us all.